Dutch people can do any (or, presumably, all) of the following while riding a bicycle: “walk” their dog, talk to their kids (seated in front of them or behind them or both), talk to people riding around them, talk on the telephone, type text messages, smoke, hold a bag of groceries, dodge any traffic that comes their way, sound pretty bells, sing songs, and pick their nose. All while keeping their back straighter than straight, and looking entirely unfazed and very serious. People do like club music here. Like even normal cozy little cafés can sometimes be found playing trance. It’s funny. They also like hair gel. I’m in an intensive Dutch course and so far it’s great. For people who know English (and in my case, German and a bit of Danish), Dutch is nicely friendly to learn at least in terms of grammar; and many words are cognate with English, German, and/or Scandinavian ones (although the meanings often [and irritatingly] differ), which not only tends to make them easier to memorize but also offers ample chances for my beloved little language epiphanies (of the ah *that’s* where that word comes from!! sort). What makes the course extra cool so far is that we get some language history, history, culture, and general discussion on the side, and the group only consists of 5 students so I’m learning a lot. They’re also nice people so I’m also having a good time. A very nice moment in the language class was when during introductions, the teacher was not at all confused when I answered the feared what are you going to study here? question with letterontwerp (type design). “Oh, yes, cool. Does everyone know what that is, yes? Zij maakt een A, bijvoorbeeld.” Wow, Nederland, land of letters. I don’t think it’s ever happened to me outside of the type scene proper that I didn’t immediately have to explain to puzzled faces what type design is, and why anyone would want to do it. I’m a bit sad that the love of the Dutch for oranje only extends to the color but not the fruit. They don’t even call them oranges (but sinaasappel, as in “Chinese apple” because that’s, uh, where they come from?). It seems like a missed opportunity kinda. On the other hand, now that I picture partycrowds throwing oranges, maybe it’s a good thing. Incidentally, fruit is spelled identically in Dutch, but finally sounds really badass. Just like Duisburg. 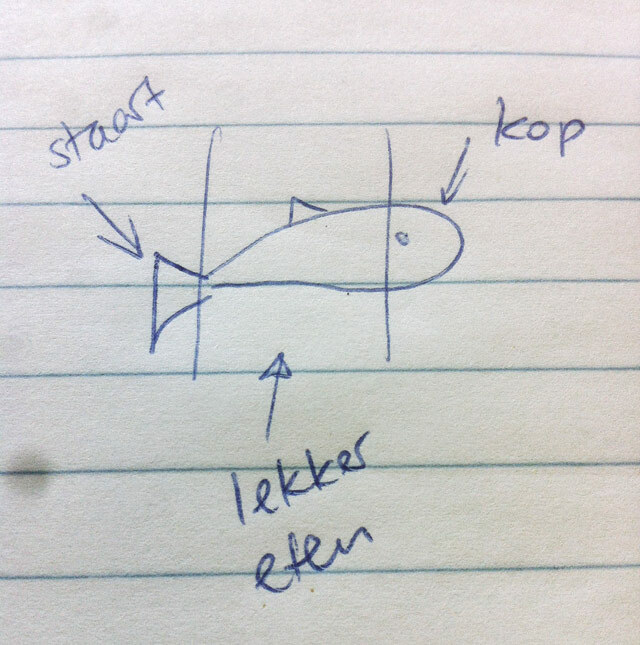 Basic utilitarian anatomy of a fish: Dutch people eat the whole thing, save for the tail (the end of the fish counter-intuitively called staart) and head. This is true, very much so in my case: Dutch staircases tend to be closer to vertical than anything resembling normalcy for non-Dutch people. (“It’s really more like a ladder”, my mother said.) The worrisome implications for moving become clear if you try to picture carrying boxes of books (or other heavy stuff) up a ladder without having any hands free to hold on… right. Next time I’d: make the boxes smaller; and try to make sure I’d have more than one person helping me. Nina! I LOVE this! Your usual delightful writing, rich with details and insight and touches of humor. I’ve been otherwise occupied and now need to see what #1 and #2 said! Thank you! Did you realize that sinaasappel is basically the same as the German Apfelsine? BTW, sinaasappelsap is a terrible test string, but it sounds great. For moving, the Dutch don’t use the staircase. That’s what the hoist beams are for! I love the way you bring humor into stuff that is so obvious to us. In Belgium we use “sinaasappel” and “appelsien” interchangeably; don’t know how common the use of “appelsien” is in the Netherlands, but they do have the orange juice brand Appelsientje. The Dutch tend to shorten “jus d’orange” using the word “jus” which also happened to be the Dutch word for…. gravy! So people order a “glas off gravy” in a bar or restaurant. It gets worse when you learn that “sudderans” can be abbreviated to “sju” (meaning jus d’oranges), but the same word (‘jus”) can also mean gravy. Thus you can hear people ordering “een glaasje jus” (a glass of orange juice) in a restaurant, but when eating potato’s, someone might ask you “wil je jus?” (Do you want gravy? ), which sounds similair. In the province Noord-Brabant it’s normal to say ‘appelsien’ in stead of ‘sinaasappel’. Maybe not so much for the younger generations, but for the generation of my parents (60+), who have the dialect as their main language. Hahahahhaa I love reading this. 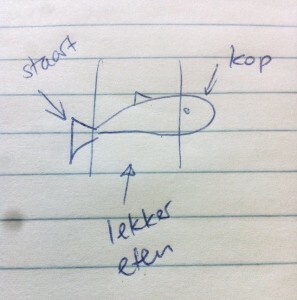 keep up the good work with your Dutch course. And I hope you discover more funny things from our country. Never heard of “tomatensudderans”, we use “tomatensap” (literally: tomato juice) in the Netherlands. Love your piece Nina, would love to see more observations from a behavioral / psychology perspective. a lot of amsterdam buildings have a hijsbalk (gantry) on the outside to use a ‘touw & blok’ (rope & pulley block) to avoid moving your stuff down (a lot of) stairs. The three wheels on either side are arranged in a triangle, which on itself can rotate around it’s center point. It’s difficult to explain, but if you see it in action it makes total sense. Very handy for moving stuff like washing machines and big boxes. You can rent them for a couple of bucks at every moving company. Veel succes nog in Nederland. Hey, thanks all for the lovely comments. Good to learn about moving – my building doesn’t have a hoist thing so I guess the Dutch thing to do would be to rent a ladderlift? Although that traploper thing looks like a really good idea too (and presumably cheaper ;) ). To be honest though I really don’t want to think about moving out right now, I like it too much here. Just FYI to new readers: I will surely write a little more about my general experiences in The Netherlands in the coming week; when my school year starts in mid-September, I expect the focus here (and in my head ;) ) to shift quite strongly to design and type. I forgot the umbrellas too. Can’t believe people can be so cool and relaxed holding an *umbrella* while cycling through the rain. Re. «staart», in my home town the old folks called a certain bird «Wippsteert», appropriately its English name is «White wagtail». That may be the Dutch — Low German connection. Sounds good, Jens – someone mentioned that bird on Facebook too so it is becoming quite a theory. I keep thinking of the Swiss German word «Stirzel» too but not sure if that has anything to do with it (see here). Plus one thing somebody told me (who has been married to a Dutch) to always bear in mind when visiting the Netherlands: Pirates! They are all pirates. Watch out. Powered by WordPress. Theme based on Book Lite. Type is FF Ernestine with SS Symbolicons Line.